As the Nike Ad says, “Just do it.” Starting has a momentum all on its own. As you write, it becomes much easier to write. If your grammar and spelling are not that good, write your article in your computer program, e.g. Microsoft Word. Show it to somebody who can help you to fix up the spelling or grammar. Then, when it is fixed, copy and paste it into the EzineArticles.com template to submit your article. Read other people’s articles. Observe the organization – beginning, middle and end. Read about good copywriting. There is so much free information online. Read the free information and step-by-step, easy-to-understand videos provided for you by EzineArticles.com about the nitty-gritty of writing. Try talking. Talk your articles into a recording device, even a telephone voicemail, and then transcribe them into the written word. Article writing can be fun once you get started. It gets easier and easier as you get your brain accustomed to creating and communicating through written words. Try Erica’s methods and take her advice for your next set of quality, original articles. 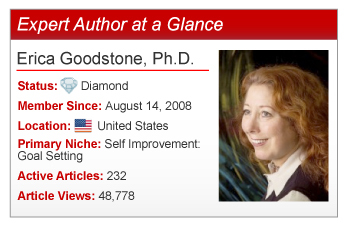 You’ll establish your presence in the Expert Author community and ultimately increase your exposure. Do you have a question or comment for Erica? Feel free to leave it in the comments section below. Your story and advice is highly inspirational to me as a person. Some times I feel discourage after I have spent quality time to bring up an article, but at the end of the day the article will not be approved by the EzineArticle base on either spelling or grammatical error which are not easily detected by me. However, I am encouraged by your write-up and I do hope to move on with the business of writing. Your record of 232 articles and 48,778 views is very impressive. And thank you for generously giving us some of the techniques you’ve been using. I hope to take a lot of inspiration from you. It is astounding how much exposure you can get from writing articles at EzineArticles.com. However, it is the consistency that leads to success. And it also helps to focus on a specific niche or two, especially if your goal is to increase business. Wow! I applaud your accomplishments here on EzineArticles. I am just starting out..i have 9 articles being reviewed before they go “live” and i plan on having at least 50 by the end of May. I have a question if you have a second. I have never used Squidoo but I have written for many other article sites. I would not take the article, exactly as it is, and put it on other article sites without linking it to the original post at EzineArticles. My advice would be for you to take the article, change it slightly – perhaps add a new perspective or additional insights. Change the beginning, have a different ending and create a new title. Then you are free to post it anywhere you choose. This is great stuff. And you are so right, once you start, the energy of writing tends to take on a force all its own. For me the biggest challenge is, in fact, getting started. Kind of like exercising, doing my taxes (which I did early this year – whooo hooo), and anything else that takes motivation. You just need to DO IT! Thanks again for sharing your success strategies. I will be printing and posting this article on my wall of fame – we all need inspiration. Since it can be so hard to get started, why not write some thoughts on a small piece of paper while sitting at lunch or at some other moment when an inspirational thought comes. Then decide that you will actually write the article at a given time that you plan for in advance. If you already have at least some of it written, that can make it much easier to continue adding to it, and then finish with an intro and ending. Dealing with an automated system can be frustrating. I would suggest finding someone who can edit your articles for you and fix up the spelling or grammatical errors. possibly even a virtual assistant. What you have to say and want to share is important. Just remember that. Dr. Erica, I’m so impressed by your long list of valuable articles. It’s been a pleasure to know you and to be inspired by all the great information you are producing to make this world a better place. Thank you so much for your kind words. You are also offering some valuable insights to others. Have you written articles in addition to your blog posts? Congratulations on your article writing. My husband and I are working with Professional disposable gloves and it seems so hard to come up with new ideas. Sometimes we feel to promote our sight can be a challenge but we’ll not give up. You must be a very busy person to have written so many articles and go to work daily. It would be good for you to think outside the box. Perhaps make a list of 50 – 100 uses for these disposable gloves. Then write an article focused on that particular problem, delilneating all the ways that your professional disposable gloves can help and how your gloves are better than your competitor’ gloves. You can also write about related topics, not really talking about the use of the gloves, but in your resource box you provide a link to your site. Hi Kay, I am curious how you are getting on with creating content for your disposable gloves niche. I am in a very similar situation and am looking for inspiration. Yes, there is so much that can be shared between people to open up more inspiration, wisdom, healing and consciousness. I thank you for sharing your success and passing on this inspiration to us all. I have read so many articles and blog posts and even Facebook shares that are so uplifting that at times I have felt, “What more do I have to offer?” But the truth is, not everybody has seen those posts when I saw them. And I may say the same thing in a slightly different way that somehow reaches a person at just the moment when he or she is ready to hear it. Each of us can make a huge difference in the lives of others. Writing is one way to reach a huge audience. I would like to write you directly via E mail is possible. I do have several articles written.They are long however, and I would like to share them with you and/or get some feedback from you about editing. Thanks Dr. Erica for responding to me. I will put the suggestion you gave to me into action because I am determined to move forward. It is worth having someone else edit your articles, even if you have to pay a fee, because then you will have something to be proud of. Having your articles published gives you credibility as an expert in your niche. Once you have created a substantial number of articles around the same topic, you can even repurpose them into an ebook. Remember, nobody can say what you have to say in the same that that you will say it. And there are people out in the world that can benefit from your knowledge. Erica congrats on the great publicity and for your article contributions to EzineArticles. Thank you so much for your warm comment. Congratulations on your success! You are truly an inspiration. I have read some of your articles on your blog and your content has really helped me. Keep up the good work! Thank you so much for your supportive comment. Have you considered writing some articles for EzineArticles.com? The process is quite simple. Your article is a practical, enabling piece – so often we can get excited to ‘share’ with the outside world, only to have our limiting beliefs hold us back. Some examples of this being ‘I can’t write with good Grammar, I can’t spell, What will people think of this’ – essentially self conscious, protective mechanisms we play out from our thoughts. How liberating to have the ‘tools’ at our fingertips – Spell checks on our computers etc. We all have value to share in this world. Narrowed down to a niche market – that is to say a group of people/cause that we feel passionate about – makes it easier to focus on the Real solutions, the real outcomes and goals that we want to contribute to that niche. Thank you Erica. It’s always a pleasure to interact with you. I would suggest finding someone who can edit your articles for you and fix up the spelling or grammatical errors. possibly even a virtual assistant. What you have to say and want to share is important. Just remember that. I enjoyed reading above posting. You are right, it gets easier as you write along. I do not know whether I write in an organized manner. What I do is simply, write according to my trend of thought and later on break up the thoughts with a little heading and if I have time a little picture. Thank you so much for your kind response yesterday! I have another question if you don’t mins? For EzineArticles.com every article must be original. Once I had 2 articles that were very similar but one was written for the man and the other for the women. EzineArticles.com would not accept the second one because the content looked similar. So I posted that second article on a different article site. It was not wasted. I would recommend to you that you take the rewritten article or articles and post them on other article sites or as a guest blogger on someone else’s site or as a blog post on your own site. Don’t attempt to resubmit a variation on the same article. Create totally new articles on different topics in your niche. I will have somebody from our Member Support Team contact you directly via email regarding this matter. Erica, thank you for sharing your advice. I have not previously submitted to EzineArticles before. Is it possible to submit content that has previously been published on our own websites and/or YourTango.com— as long as we note the original place the article was published or does it need to be original content? I believe it needs to be original content. So you can take the article you have already written and make a few changes. Alter the perspective or focus. Create a different beginning and a new ending. You can also create a new article for each concept in your book. Congratulations! As always you are a model to take guidance from. You just inspired me to sign up to EzineArticles and write again. Thank you! I am thrilled that I have inspired you to write. I have really appreciated EzineArticles.com over the past few years, especially for the comfy mug they sent me at an early point and then another one when I completed the “100 Articles in 100 Days” challenge. I am a bit concerned now….My account is suspended….they said i made a mistake with a duplicate article. You truly walk your talk! So great to see you generously offering your wisdom to the world – as you have done for years. Carry on. Thanks! Thank you so much for your sweet comment. I know you are offering some pretty powerful healing wisdom as well. Thank you so much for your generous offering . You offer much to our community of bodymind practitioners. I see you have another marker of a successful person: persistence. The idea that just “starting” has its own momemtum is encouraging. I would encourage you to write for EzineArticles. You can write about the wonderful Rubenfeld Synergy Method which you teach and know so much about. At EzineArticles they provide daily blogs about how to write effective articles and they also have some delightful short instructional videos. Congratulations on your great success, Erica. I’m sure your compassion and wisdom play a big part in helping to spread your messages around the world. Keep up the great work! Thank you so much. I know you have done some powerful writing. Have you written article here at EzineArticles yet? You have an important message to share with the world and writing articles can help to spread that. Erica, thanks for inspiring us. I do have a question. What were your struggles when you started writing and how did you managed to overcome it? That’s a great question. I have had a few struggles and challenges with writing. First, I have been afraid to share my work openly with professional academic colleagues because they can be critical and expect research verification. But as a psychotherapist and body oriented psychotherapist working with private clients I have learned a lot about relationships, how the body works and emotional responses that are not strictly verified through research. Some of my work is intuitive, based upon years of experience. So finally, I decided to just write what I know and not worry about what others might think. Second, when I finished my Ph.D., after years of having done research style papers, I was writing in a stilted academic way that is not easily followed and understood by the average person. I needed to work with an editor to get my book, Love Me, Touch Me, Heal Me into a format that was easy to read. Third, there are times when I feel blocked, no ideas seem to emerge and I just can’t write. So I don’t attempt to. I go off and do something else (go to the health club, walk on the beach, pay some bills) and I read articles from other people. Fourth, I always have paper and a pad near me so I can jot down ideas when they occur. If I don’t write the thought down immediately, I may not recall it later. Thanks for posting this article. Is there any ezine software that checks the content for errors. While I can’t make any software recommendations, I can tell you that there is software designed to check the quality of the content of your article beyond just spelling an grammar. Do a search for “style and usage checker” and you should be able to find a good one. Erica, thank you so much for your help with my account being suspended…Everything is back on now and my second article just went live minutes ago! You and the EzineArticles staff are great! Very with the personal attention and friendly advice. I am so happy you are back online with EzineArticles. It is good for you to reach out, find out the requirements, and then promote yourself and your work within the guidelines for the specific site. Life is much easier and even more rewarding that way. Hi Dr. Erica. You are so inspirational. I am just starting to write articles. My expertise is in social work, education,missions and early childhood. I am currently retired, less than a year, and I just don’t know where to start, subject wise, in article writing. Any ideas? My immediate response to your question is that you can write about social work, education, and early childhood. If you still receive journals and newsletters, you can take a few articles and share those concepts in a simplified language to reach the general public. Share what you have learned about the way the system works, how people heal, how to help children, what you would do to educate someone on a certain topic. Get some ideas about setting up the style of a particular article from those wonderful EzineArticles videos and blogs. Get some ideas from your journals and newsletters and choose the topics from those you are already familiar with – and put your writing about the topic into one of the formats described. For example, 5 steps to…, 5 things I’ve learned about, the benefits of…, what parents should know about…. I hope this is helpful to you. Please write and share what you know (that maybe you think everybody already knows – but they don’t). Share about some of your working experiences and some of your life experiences. All I can say is don’t give up. I was even told by more than one web seminar instructor the “That’s a tough one” Experience in the use of disposable is helpful or I try and think of places I’ve seen these gloves being used and the reasons. What is very tough for me is having to write articles containing 400 words or more. Good luck and as they say keep looking outside that box. Thank you for your support. Just keep writing and you will find it gets easier with practice.